As a club we hold regular adult beginners’ courses. The courses last 6 weeks and cost £50. The course is predominantly run by Diane Goodwin with the assistance of our other club coaches. The courses are run as small group sessions (maximum of 8 people) where you will receive directed tuition regarding the basics of fencing. All equipment required for the course will be provided. The course aim is to provide a general introduction to the sport and upon the completion you will have a basic understanding of the key elements of fencing with the foil, such that you will be able to engage in bouts at club level. The course is predominantly focused on foil however you will also receive an insight into the use of the sabre and epee. To assist with this, experienced club/competition fencers will demonstrate the weapons. 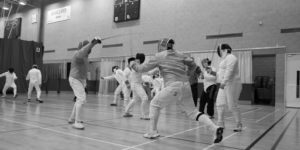 At the end of the course you will be provided with additional information about the Norfolk Fencing Club and will be given the opportunity to attend two club nights after the completion of your course for free. After this if should you choose to pursue the sport and build upon the basic knowledge and skill you have acquired you will need to become a member the British Fencing Association and choose whether to attend the club as a member or a visitor. Please contact us for more information or to find out about the start of the next course.